It's not 5 stars, but the Victoria Falls Hotel is the spot for a traditional stay at a spot which is practically stuck in time. Go for a room which is facing the falls, and has a view of the bridge. A say at the Zambezi Sun, footage of the viewing deck at sunset, supper at the hotel, helicopter ride over Victoria Falls, walk through the rain forest. April 2013. Just opened for business - a new Pioneers Camp with 6 tents on the Upper Zambezi on the outskirts of Victoria Falls. 19 February 2013. Albida Lodge announce that they will refurbish their Victoria Falls Safari Lodge during 2013. This follows the construction in 2012 of the Victoria Falls Safari Club. 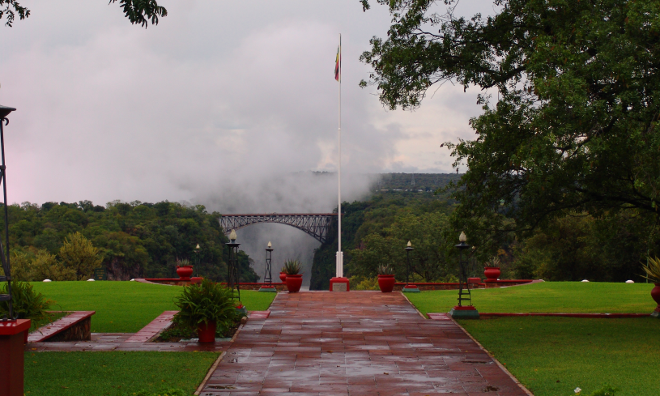 Joan Larsen recommends a stay at the Victoria Falls Hotel to experience "a grand British colonial hotel befitting of the grand old days" - you'll enjoy its "gardens of frangipani & bougainvillea", the "chorus of frogs" and "immaculate lawns". There's the "best high tea on the continent" (ok, the Mount Nelson in Cape Town may disagree with that! ), the "Edwardian rooms & lounges" & of course the sound of the falls & the sight of the mist rising up. A directory/list of the official contact details of hotels in Victoria Falls, Zimbabwe. Here's footage of an Aussie bungee jumper, whose cord broke when she jumped off the bridge at Victoria Falls - she swam to safety. this place locally known as Mosi-oa-Tunga or the Smoke that Thurnders. could not sleep that night because of excitement. fascinated by the night view of the falls during the night. January 2010. Those days were amazing and unforgottable.